DrumPerfect Pro v.3 is without doubt the most complete, open, fully programable drum/percussion music production system ever created for iPad. The wealth of professional features it offers is just astonishing. Yet its most distinguished quality is probably its confounding capacity to emulate so musically the human feel of pro drummers performances in any genre, as you will see. In the musical consciousness, rhythm is without question a most fundamental element. Combining movement with numbers, it is found in music all around the world and at any period of human history. Musicians, particularly drummers and percussionists by nature excel in precise body movement, coordination and inevitably inspire listeners to join the dance. On the other hand computer systems excel, by design, in powerful processing of numbers. We are constantly, Marinus and I, attentive to this simple fact when refining and expanding DrumPerfect Pro. Because we want our app to excel in coming as close as it can be, to a perfect integration of both performances. In this new version, if you are passionate about rhythms, drums and beyond, you will find, we think, the best companion for your music adventure and production. Its flexibility will surprise you. Program on multitrack/layers, multi-velocity sampling, the most intricate patterns, improvising songs. Unleash your wildest experimentation in the creative and fun process. 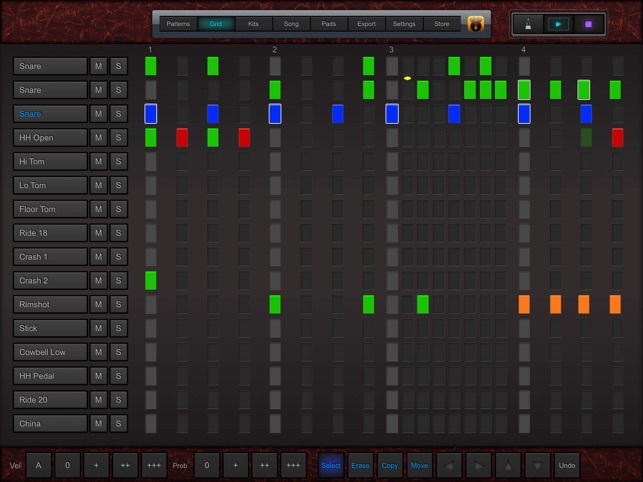 - easy loading and playing of your own library of midi files. - study, understanding and experimenting from the massive collection of world rhythms available in the packs. A fantastic General Midi pack to cater for all your midi files plus the new series of patterns all styles included. This pack is FREE to download. The first brush drums pack, Brazilian Rhythms vol.2 , filled with soft and smooth grooves that will certainly transport you to the golden beaches of Brazil. This pack completes the trilogy of Brazilian Rhythms vol.1 and Batucada vol.1. 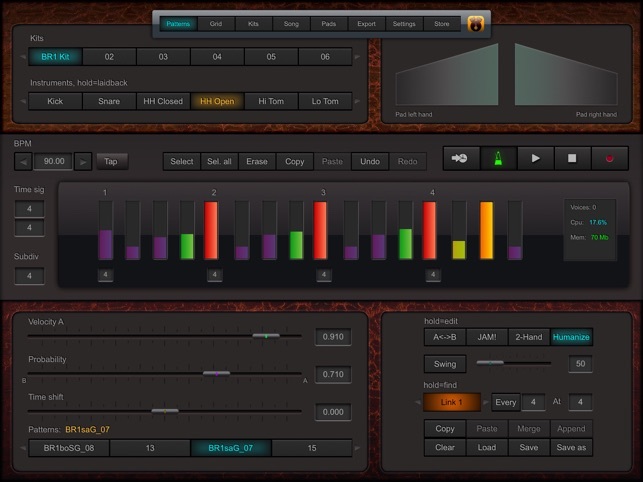 As powerful as a desktop VST plugin! I just discovered DPP and decided to pick it up, thinking OK, my expectations aren't very high, because most drum apps on iOS don't really cut it for professional productions, unless you're into electronic music. Boy was I wrong! DPP is so deep, it easily rivals the best VST plugins on desktop machines. Be ready however for a learning curve. This is not one of those apps you just pick up and get going with in five minutes (although it's actually very straight forward once you get the hang of how things are laid out and handled). The sounds are very decent, but I prefer to use my own Samples, giving me a good cross-platform compatibility with my desktop DAWs. 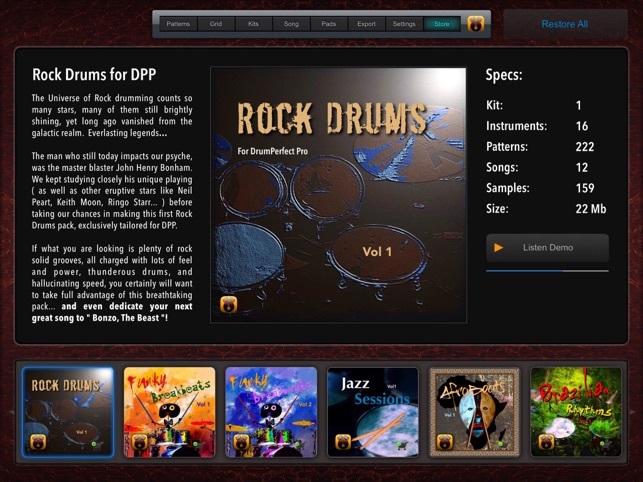 Overall, DPP is an amazing drum app, not only for real drums, but also percussion (available as iAP) or electronic drums, making it a great all-round Drum app. I patiently waited until more velocity layers were added, and my patience was rewarded! 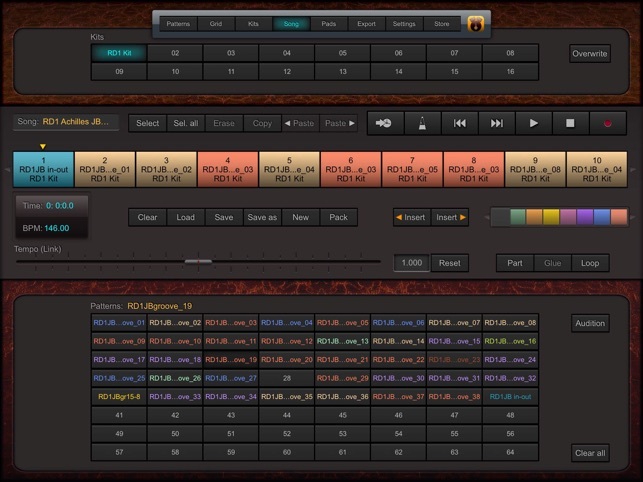 First of all, DrumPerfect Pro incredibly flexible, with features that aren't found in ANY other drum machines. Unusual tuplets can be assigned on each track individually, and per beat if desired. Tempo can be assigned per pattern, and the entire song's tempo can be scaled up or down relative to the individual pattern tempos. The included sounds are great. The convolution reverb sounds wonderful. And there are newer features dealing with tempo, dynamics and humanize functions. 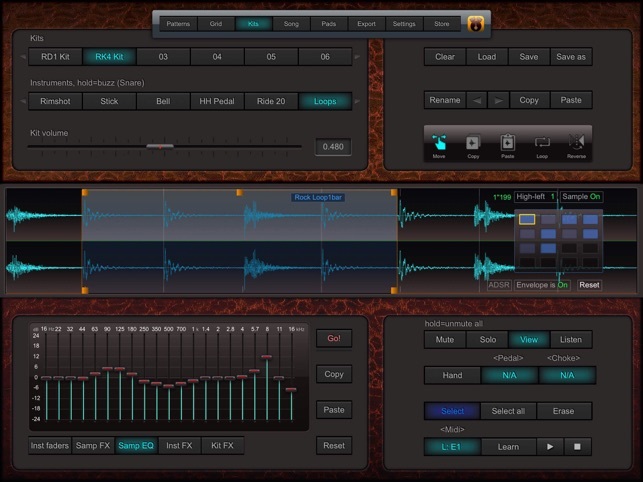 The GUI is pretty stoic, and the workflow can be a bit tedious, compared to other more simple drum machine apps. As a very powerful and deep drum machine, it must be challenging to balance all the factors that make it powerful against those to make it easier/quicker. If you are an intrepid explorer of new and exotic rhythms, get this (and get Metronomics, too). Edit: The “blurred controls” issue was fixed in v3.02. As far as the “can’t get it to work” bit is concerned, would you mind telling us what the issue is? Maybe we can help!